HARARE: Australia beat Pakistan by 9 wickets in the second T20 match of the tri-series underway in Zimbabwe on Monday, ending the Green Shirts’ eight-match winning streak in the shortest format of the game. Fast bowler Billy Stanlake demolished Pakistan’s top order with four quick wickets as they were held to 116 all out. 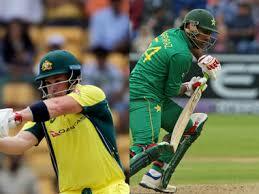 Australia chased down the target in the 11th over, powered by skipper Aaron Finch’s 68* off 33. Stanlake took 4 for 8 in his opening burst, the most economical spell by an Australian in T20 international cricket, and the second best ever behind James Faulkner’s 5 for 27 the last time the two teams met. However, Stoinis soon had his revenge, bowling Ali for 22 as Pakistan slipped to 61 for 6. It was then left to Pakistan’s lower order to guide the team beyond 100. Faheem Ashraf managed 21 before he was bounced out by Jhye Richardson, while 19-year-old Shadab Khan cracked a four and a six to top score with 29. Khan fell trying to quicken the run rate in the final over, and Andrew Tye quickly wrapped up Pakistan’s innings with two more wickets as the side were bowled out one ball short of the full 20 overs.